An injured man told local television channel KTLA: "We just dropped to the ground, we heard a lot of screaming. My friend is the DJ so she cut off the music, we just heard a lot of mayhem." Another witness from inside, Teylor Whittler, said: "I was on the dance floor and I heard the gunshots, so I looked back and then all of a sudden everyone screamed: Get Down! 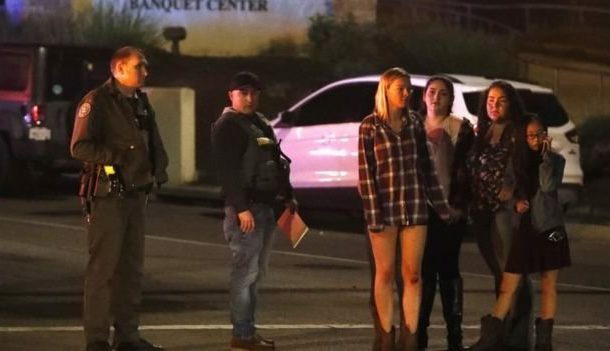 The deadliest attack in modern US history came last year in Las Vegas when a 62-year-old man opened fire on a crowd of 22,000 country music concertgoersfrom the 32nd floor of a nearby hotel, killing 58 and wounding hundreds. The previous most deadly attack was another just a year earlier, when 49 people were killed in Pulse - a gay nightclub - in June 2016. in Orlando. Some students from Marjory Stoneman Douglas High School in Parkland, Florida - where 17 were killed in February - have taken up a public campaign for gun law reform in recent months but little in the way of change has emerged from legislators.